Differentiation of the degree of channelization of the Baikal basin has a clearly pronounced zonal nature: from 0.1 km/km2 at the south-eastern boundary to 0.9 km/km2 on the coastal ridges and in the northern territories. A high degree of channelization is characteristic of the taiga zone, especially of ranges and valleys immediately adjacent to the lake. In general, the northern part of the basin is characterized by favorable conditions of flow. Mountainous terrain, steep slopes and the presence of permafrost contribute to a rapid discharge of water into the main water streams, namely, the Upper Angara and the Barguzin, and to the development of the river network. The highest density is specific to the western slopes of the Barguzinsky (0.92 km/km2) and Khamar-Daban (0.69 km/km2) ranges. Among the plain territories, the most water-abundant areas are the Barguzin valley (0.89 km/km2) and the area of the Selenga river delta (0.68 km/km2). The middle part of the basin is characterized by the mid-mountain terrain and a high occurrence of sandy and sandy loam soils. The presence of these factors provides for the average degree of channelization ranging from 0.35 km/km2 in the middle reaches of the Selenga river and 0.55 km/km2 for the Chikoy river basin to 0.61 km/km2 for the Khilok and Dzhida river basins. In physical-geographical terms, the south-western part of the basin, i.e. the area of Lake Khovsgol, represents a forest-steppe with the high-mountain depression terrain, and is characterized by a lower degree of channelization ranging from 0.32 km/km2 for the Delger-Muren river basin to 0.34 km/km2 for the Egiin-Gol river basin. In the southern dry steppe part of the basin a low degree of channelization is registered. 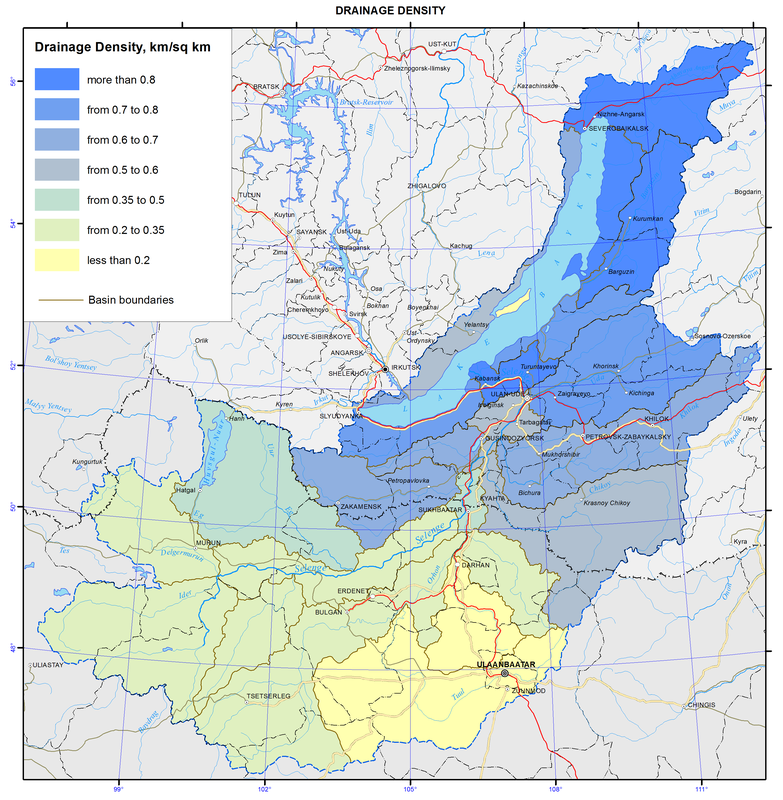 This is especially typical for the Tuul and Kharaa river basins; here this index is below 0.2 km/km2.